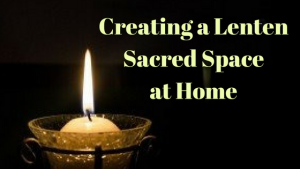 Last week I read this article called “Creating a Lenten Prayer Space at Home” and was inspired to rearrange my home sacred space to help create a prayer filled environment for the special season of Lent that begins tomorrow. I found a purple cloth for my altar. Purple is the color of Lent. Black used to be the color associated with Lent since purple dye was so expensive to reproduce. Purple emerged as the color of royalty. We are remembering Jesus is our King and Savior. Purple now represents mourning as we ponder the sacrifice of Christ. This time of year, I hear God’s invitation to be open and empty, thus I have a small stature of open hands – willing and waiting and an empty bird nest. Bird nests are a powerful image for me, representing what now lies dormant will soon hold life. I wrote about them on this post called “Winter Lessons from the Bird Nests”. A cross. Always keeping the cross before me, acknowledging all that Jesus has done for us. Several pieces of sea glass prompt me to pay attention to God’s creation and unexpected gifts. Several symbols that remind me I am a beloved child of God always in the presence of a loving Lord. While I was rearranging I straighten up the nearby shelf that holds my Bibles and devotional books. That area had become cluttered and overflowing so I relocated material I wasn’t reading during Lent and compiled the books I needed for these 40 days all into one basket. No excuse now right? As I write this, I think I want to add a candle yet. Maybe a purple one? 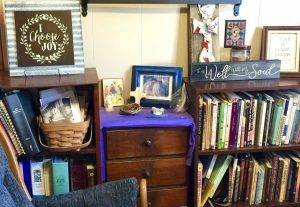 Do you have a home altar? 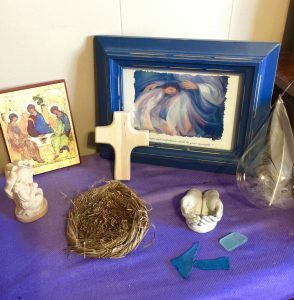 What special symbols and items would you add to a home Lenten sacred space?